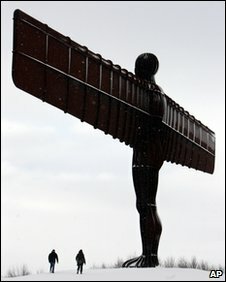 Roads across north-east England remain treacherous following heavy snowfall across the region. Motorists are being advised not to travel unless absolutely necessary, with conditions particularly bad in Northumberland and North Tyneside. Routes in County Durham and Teesside have also been affected, and there has been more snow in eastern Cumbria. However, there have been no major road closures or accidents as many people opted to stay at home, said police. 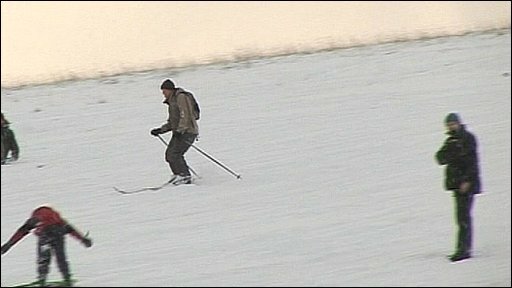 Up to four inches (10cm) has fallen in places, with underlying ice making driving conditions particularly treacherous. Conditions on rural roads are "horrendous", according to Northumbria Police. Sgt Steve Pick told BBC Newcastle: "What we're suggesting is that people don't travel. If you need to travel, take the necessary precautions. "Make sure you have a mobile phone, leave plenty of time for the journey and take a great deal of care." But he said most of the roads were quiet because motorists had heeded the advice at stay at home. In the Durham and Teesside areas, main roads have been gritted and are passable with care, though many minor routes remain problematic. Anyone who does travel is urged to plan their journey and be prepared for disruption. The Highways Agency said drivers should also carry a blanket, warm clothes, food, a hot drink and a shovel. More snow is forecast for north-east England on Saturday and Sunday, while overnight temperatures from Friday through to Saturday are expected to fall below freezing.